Home » Candy Recipes » Lots of White Trash – what’s better than a treat made with all of our childhood favorites? Lots of White Trash – what’s better than a treat made with all of our childhood favorites? If you like chocolate covered Oreo cookies, you will enjoy this snack mix. You can substitute the candy for Reeses Pieces or use Captain Crunch cereal instead of Fruit Loops….a big favorite with friends and family. Thanks to scottsfrog for passing along this recipe. If you like chocolate covered Oreo cookies, you will enjoy this snack mix. It combines a little bit of sweet with a little bit of salty. You can substitute Reese’s Pieces for the M&Ms or use Captain Crunch cereal instead of Fruit Loops. Whatever you put in it, this will be a big favorite with friends and family, especially for the holidays. What is Vanilla Flavored Almond Bark? Almond bark< is a chocolate-flavored white concoction that is made to melt easily over candy, pretzels, cereals, and more! This particular bark slab combines the delicious flavors of almond and chocolate to create a scrumptious white festive coating on your snack mix. >Love Snack Mixes? 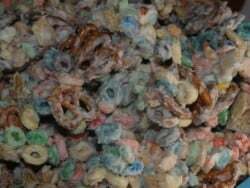 Try these crowd-pleasing copykat snack mixes. What’s better than a treat made with all of our childhood favorites? Mix all dry ingredients in a very large container, can of course use a trash bag. Melt bark according to package directions, once melted, pour over cereal mixture and stir well. After coating all of the cereal mixture, spread on foil covered baking sheets to cool. Once cool, break into pieces and store in airtight containers. Thanks to scottsfrog for this recipe. throw some fruity pebbles in the mix and i’m sold.INNIT!